Topics: Mdb Repair, Order Accessfix, Accessfix Demo, and Outlook Recovery. Age: It went live on December 17th 2001, making it over 16 years, 3 months old. 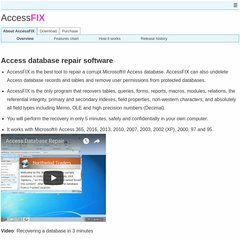 accessfix.com How to recover an Access database when you cannot open it due to .. Steadfast Networks (Illinois, Chicago) is the location of the Apache/2 server. Accessfix.com's IP address is 208.100.39.44. ns2.cimawaresoft.com, and ns1.cimawaresoft.com are its DNS Nameservers. PING www. (208.100.39.44) 56(84) bytes of data. A ping to the server is timed at 53.1 ms.